From corporate to artisan, brothers-in-law Pat Ford and Tim Welsh are passionate about their handmade cheeses! When you take a bite of Beehive Cheese, it melts like butter in your mouth. That's because Beehive Cheese is made from the creamiest milk in Utah and lovingly crafted into superior cheese by a family who shares a passion for the artisan way of life. In 2005, brothers-in-law Tim Welsh and Pat Ford left the fast-paced world of software and real estate seeking a simpler way of life as cheesemakers. They traded their grinding commute and laptops for quiet pre-dawn mornings sitting with 500 gallons of farm-fresh milk carefully mixing and warming it for hours to develop their unique cheese. Delighting in the sweet smell of warm milk, they fell in love with the natural rhythms of making cheese the old-fashioned way. The long days of polishing their recipe and the months spent waiting with an artisan's patience for wheels to ripen to perfection have made their cheeses some of the best in America. 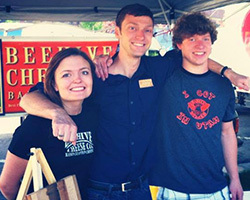 The Beehive Cheese family is delighted to share their passion with you. These two brothers have been working at Beehive Cheese for about 10 years since the family creamery started. Their father Tim and uncle, Pat, started the company and, as a family, they are living their family's dream of making quality, artisan cheese. Britton has the American Cheese Society's certification of Cheese Professional and helps oversee the cheesemaking efforts. Hayden coordinates cheese shipments with customers and customer service. Barely Buzzed is a unique espresso and lavender hand-rubbed cheese with subtle notes of butterscotch and caramel made from the milk of Jersey cows. It is a full-bodied cheese with a smooth, creamy texture. Colorado Legacy Fine Coffees produces a Beehive Blend of South American, Central American, and Indonesian beans roasted in different styles exclusively for Barely Buzzed. This unique espresso blend is then mixed with French Superior lavender buds and freshly ground onsite. Rubbing the cheese produces notes of butterscotch and caramel near the rind, which find their way to the center of the cheese. Barely Buzzed is then aged in a humidity-controlled facility, moving through two different temperatures during the aging process to develop texture and flavor. 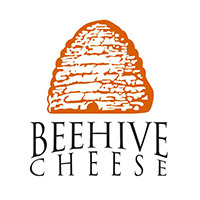 Barely Buzzed is Beehive's most popular cheese and is considered by many to be a great American original. Pairing suggestions: Medium and full-bodied wines, ports, bourbons, ales, stouts and ciders. toasted nuts, chocolate, fresh fruits or charcuterie. Hand-rubbed with local honey and Redmond RealSalt®, SeaHive is a beautifully balanced treat. Made from the milk of Jersey cows in northern Utah, this is a full-bodied cheese with a smooth, creamy texture. RealSalt® is harvested from an ancient sea bed near Redmond, Utah, and contains unique flecks of color from more than 50 natural trace minerals. SeaHive is shaping up to be one of Beehive's best cheeses. It is a true expression of local flavors, superior quality, and creativity. Pairing suggestions: Hoppy ales, fruity white wines, straight bourbon, a variety of nuts, or shaved on salads and soups.